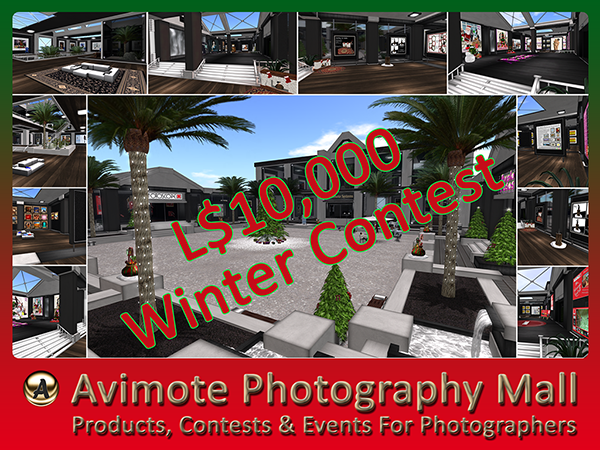 The Avimote Photography Mall is open for preview and, to celebrate, we have launched a L$10,000 photo contest. Only a small number of entries will be accepted, making the odds of winning thousands of Lindens unusually high for those who get there first. Join the new Avimote Photography group to receive advanced notice of future photography events such as contests, classes, gallery showings and promitions. Contest entries can be dropped in the frames either side of the Avimote store and the contest board is at the back of the store.